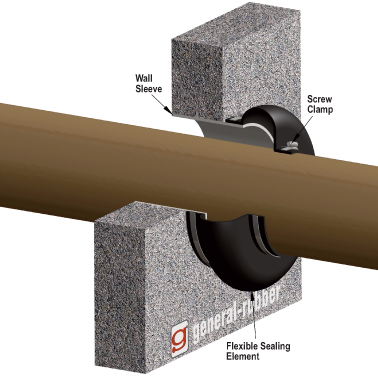 General Rubber's Styles LPS and EPS penetration seals enclose and seal pipes through walls, floors and casings. General Rubber's Style LPS is a link penetration seal offering 20 PSI (40 feet of head) and 250°F service. They enclose any round or radius penetration and are available in a wide variety of sealing elements, pressure plates and hardware. Additionally, they absorb noise, vibration and minor misalignments. General Rubber's Style EPS is an expansion penetration seal with excellent all-directional movement capability offering 20 PSI (40 feet of head) and 250°F service. They are available in flanged or slip-on designs in a wide variety of materials of construction. Custom designs available for larger movements, higher pressure and/or higher service temperatures. Split wrap designs are available for field installation around existing penetrating pipe applications. Additionally, they absorb noise, vibration, pipe misalignment, thermal movements, ground settlement and seismic displacements.